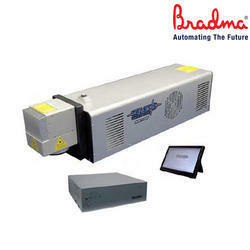 We are a leading Manufacturer of telesis co10a laser marking system from Mumbai, India. The TELESIS CO-Series Laser Markers, available with standard power levels at 60W and 10W and are excellent choices for high duty cycle applications on plastic, rubber, wood, paper, anodized metal and label marking applications. They are perfect for “Marking-on-the Fly” as well as stationary marking. Their RF-excited CO2 tube assures a long life cycle as well with virtually maintenance-free operation. Due to their compact size and modular construction, the CO-Series markers can go almost any place they are needed on the plant floor. Marking Speed:Character marking speeds and production line speeds depend on material, character size and the desired marking quality.